ParkIT access control camera - ARH Inc. The ParkIT camera was designed for access control systems. 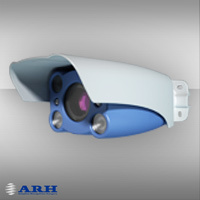 Ideal cost effective camera from smaller systems to large projects designed for license plate recognition applications. Designed for license plate recognition application, the camera includes synchronized illuminator unit providing ideal images during day and night. During the development, besides the high level of technical features (pan-tilt, hidden cabling), the focus was on the sophisticated, eye-catching design. ParkIT is an easy installable, small and attractive camera. Extra software module is provided for easiest integration with CARMEN OCR engines and software modules. ParkIT is an excellent choice for LPR/ANPR based access control, parking management systems.